Locations, People, Bestiary Posted by GM. To the caravan drivers of Amn and Sembia, the Western Heartlands are known as "miles and miles of miles and miles" - windswept, grassy flats skirting impassable bogs, badlands, rolling hills, high moors, and lonely forests, all of which are filled with monsters. The farmers, frontier folk, walled-city dwellers, and other hardy souls who live here are strong and independent enough to carve successful lives out on the frontier where skill and intelligence count for more than one's bloodline. The Western Heartlands are home to dozens of separate walled cities, racial enclaves, farm towns, monasteries, fortified strongholds, and armed domains. The Western Heartlands welcome ambitious adventurers. A dozen crumbled empires have sought to conquer or dominate the region, leaving behind fortifications built upon by waves of subsequent would-be monarchs. Others left behind treasure troves, high and perilous magic, or both. Unlike the densely packed regions in the Heartlands and the North, the Western Heartlands require long stretches of overland travel between destinations - but at least no one freezes en route. The Jewel of the Vale occupies a fortuitous position astride both the Uldoon Trail from Amn and the River Chionthar. The city has an age-old reputation as a place for trade and for peace parleys, a status encouraged by its current administrator, the High Lady Cylyria Dragonbreast, Cylyria is one of the leaders of the Harpers, whose most powerful base, Twilight Hall, stands beside the town's temple to Deneir. The Harpers use Berdusk as their base of operations in the West and the North. Lady Cylyria keeps the city firmly in the Lords' Alliance and uses her influence to temper the strictly profit-minded policies of the city's rivals in Iriaebor and Scornubel. This message was last edited by the GM at 09:01, Sun 13 Jan.
Gnolls are very tall, with the average member of the race standing on between 7' and 7'6". Though gnolls are relatively lean for their height, weighing in usually between 280 to 320 lbs, they cut an impressive visage. Gnoll skin is greenish-gray and their furry hide a light or dark brown hue, sometimes marked with spots or stripes. Many gnolls also have a dirty yellow to reddish-gray crest-like mane that stood on end when they were angry. Gnolls live a nomadic lifestyle in small clans often part of a larger tribe. There are many Gnolls in the Reaching Woods within the Western Heartlands that raid isolated villages or travellers. 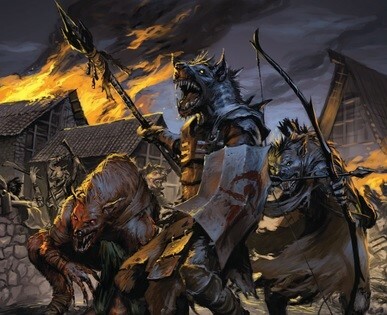 The only thing stopping Gnolls becoming a serious threat to the region is that they war with each other as much as other humanoids and are hunted by the Centaurs of the forest and grasslands. A griffon has the body of a lion with the head and wings of an eagle. The forelimbs of the griffon are like those of an eagle, ending in sharp talons, but this was not always the case. Just as lions and eagles had varying physical characteristics based on where in the world they are found, so too did griffons. 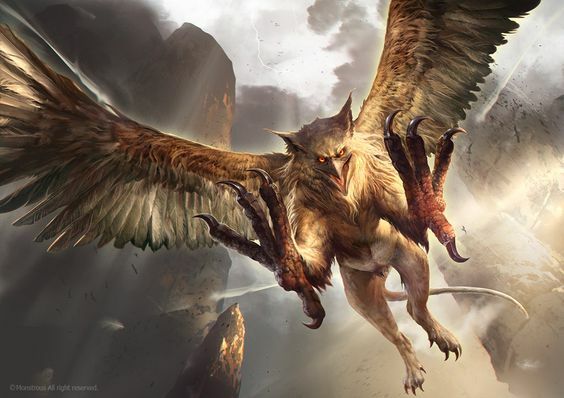 An adult griffon is about 8 feet long, with a wingspan of 25 feet. The average griffon weighs about 500 pounds. They are highly sought after as mounts, although the practice is outlawed in some kingdoms as it is considered a form of slavery. This message was last edited by the GM at 21:59, Sun 27 Jan.